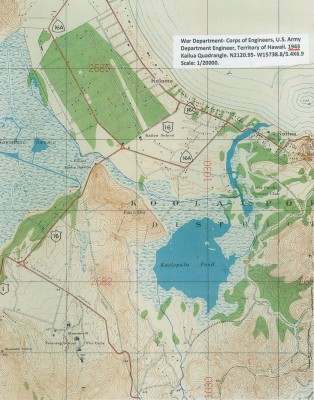 1943 Map showing the extent of the original lake and the surrounding wetland. 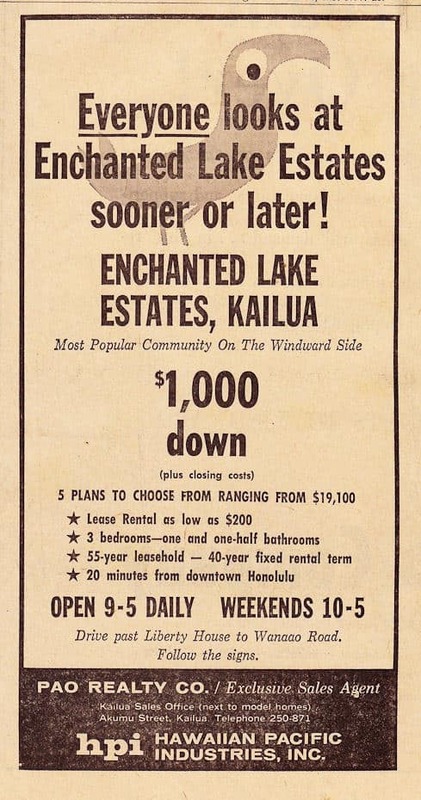 Before development of the Enchanted Lake subdivision in the 1960s, Kaelepulu Pond covered nearly 190 acres with an additional marsh area of 90 acres. With the development, the pond was renamed Enchanted Lake and reduced to 79 acres. 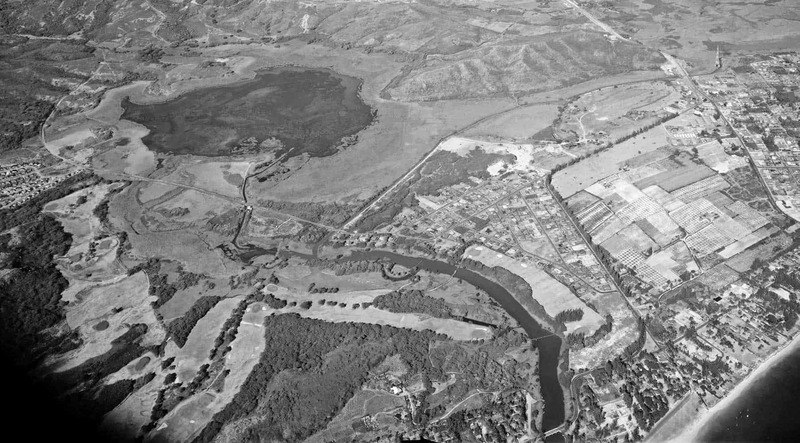 In 1966, a flood control project permanently diverted the thousands of gallons of fresh water that once flowed daily into Kaelepulu Pond from Kawainui Marsh. Pollution from storm drains and silt that flows into the lake from exposed dirt at construction sites and unplanted yards continues to take its toll on the lake. Fish found in this brackish water lake include milkfish, mullet, barracuda and tilapia. Kaelepulu fishpond was formerly a very important fresh-water pond located about 2/3rds of a mile from the shore. In 1880, Princess Ruth began to lease lands around the Kaelepulu Pond to dozens of Chinese farmers. Many of the former taro fields were replanted with rice. Some planted sugar cane around the pond. 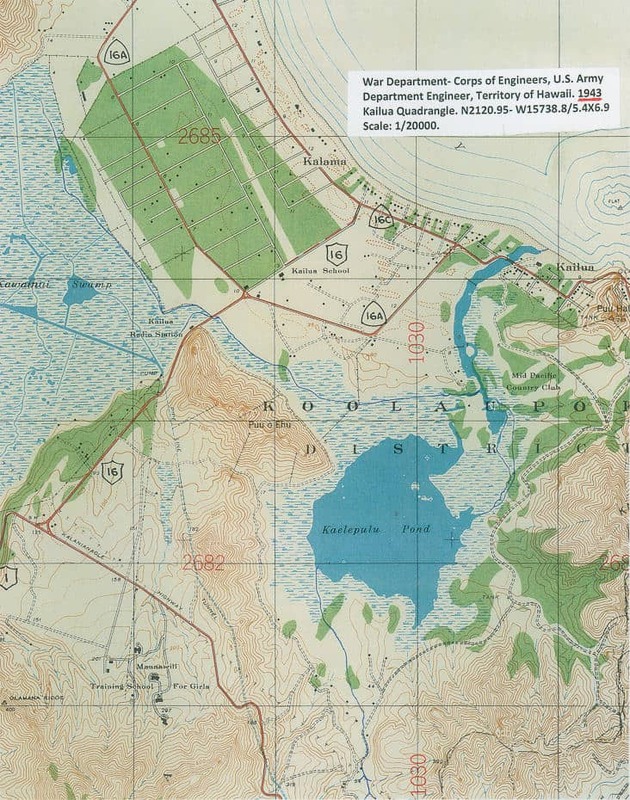 The Alexander map of 1884 shows a water area of 190 acres and an additional marsh area of 90 acres for Kaelepulu pond. There was an outlet on the sea side and the pond was limited by natural contours and earth embankments. There were taro patches between the pond and the stream from the Kawainui marsh. The stream was diverted into patches and from the taro terraces ran into Kaelepulu. When the taro land was being dried, there was a ditch which could be used to bring water from the Kawainui stream to the pond. In 1939, a letter written by Mrs. Charles Alona described the fishpond as once being much larger and very clean. According to Mrs. Alona, the people of that locality always saw to it that the ponds were kept clean in the olden days. Fat mullet, awa, ahole and oopu fish were found there and limu kala-wai. Bullrushes (akaakai) grew around the edge of the ponds at that time. Mrs. Alona remembered going with her grandmother to gather the leaves. They pumped 2 million gallons of water daily from Kaelepulu pond to water their sugar fields. The stream was dammed each winter so that there would be enough water for the Waimanalo sugar. In 1947 the plantation was shut down, there were no reports as to when the pumping of Kaelepulu ceased. In 1954, developer Joe Pao’s development company, Lone Star, formed a joint venture with Bishop Estate to develop the 700 acres surrounding and including Kaelepulu pond. Pao renamed the area Enchanted Lake. As part of the Enchanted Lake development agreement the infrastructure, which included storm drains, was deeded to the City with a drainage easement to the pond. Building around Enchanted Lake started in 1960. 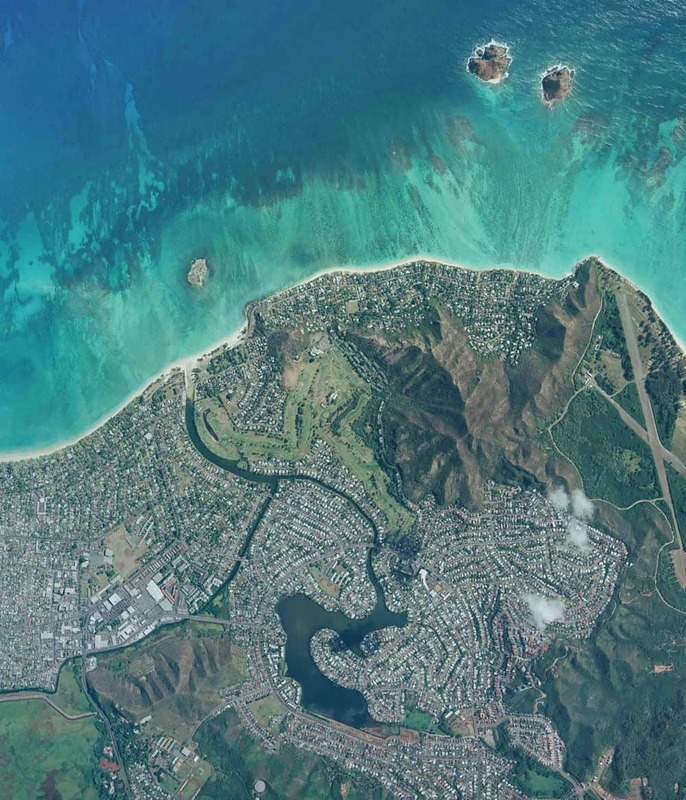 The first area that Pao developed was Keolu Hills, consisting of 105 lots, followed by another development called Kailua Heights. Eventually Pao’s developments in Enchanted Lake numbered 3,000 home sites. Pao used earth from the two hill projects to fill the shores of the pond. He also set up pumps that drained the water table through a newly dredged channel and canals of Kaelepulu Stream as well as pipes that ran to Waimanalo. Lone Star dredged the lake to a depth of about 15 feet and it was initially quite clear, supporting prolific fisheries and oyster beds. 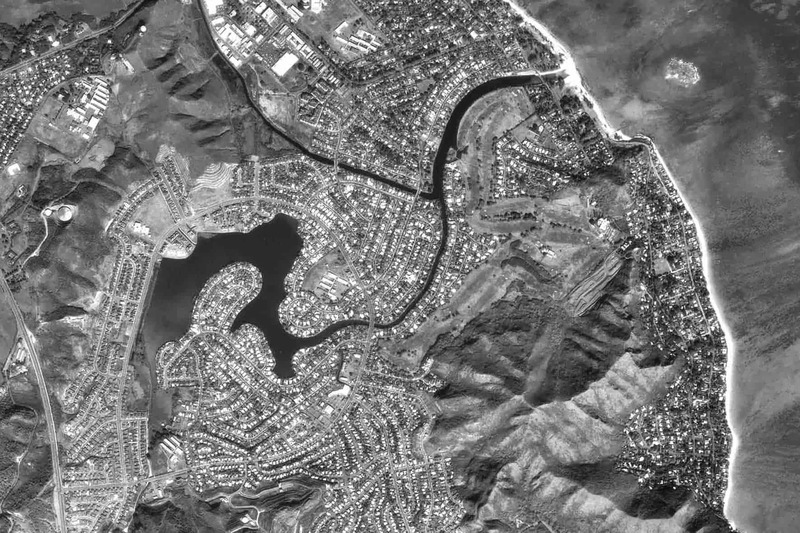 Subsequent housing development of the surrounding hills and non-point source pollution from the urban neighborhoods has progressively silted in the pond (maximum depth presently around 9 feet), lowered biological diversity, increased turbidity of the water, and threatened already endangered waterbirds. A privately-owned 5.8 acre wetland located at the south-west end of the lake was created in 1995. It provides habitat for native Hawaiian waterbirds – coots, gallinules, and stilts – as well as migratory birds such as the Golden Plover. A recent bird count of endangered birds at the wetland tallied 12 Hawaiian Stilts, 77 Coots, and 15 Gallinules. Numerous Black-Crowned Night-Herons, Cattle Egrets and Mallard/Koloa hybrids can also be seen at this wetland. Learn more at the Kaelepulu Wetland website. 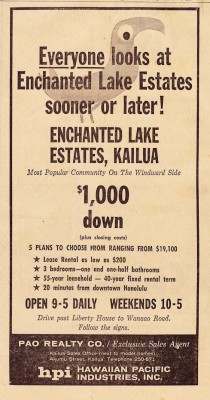 During the development of the Enchanted Lake community, the initial lakeside lots were leasehold property, and the Bishop Estate/Kamehameha Schools was the owner of both the lots and the lake. The ELA, as established for the initial lakeside lots, was originally a voluntary membership organization to support the lake. In 1973, as Kukilakila was being developed, the developers of that community established a requirement for those units to be members of ELA. This was changed in 1987 when the Bishop Estate proposed to sell and convey its fee simple interest in the Residential lots to the leaseholders. As part of that process, a new organization, the Enchanted Lake Resident Association (ELRA) was formed and Bishop Estate conveyed fee simple ownership of the lake to the ELRA. Both the initial lakeside lots and Kukilakila were provided membership in the ELRA. Bishop Estate’s Supplemental Declaration of Protective Provisions (DPP) of September 1987 stated that it desired to provide for the continued care, maintenance, repair and control of the lake for the mutual benefit of the owners and lessees within the ELRA. It established requirements, including assessments, for the purpose of maintaining the use and enjoyment of Enchanted Lake. These requirements and obligations conveyed to the owners as they purchased their lots from Bishop Estate. By 2000, most of the single-family homes had converted to fee simple, and today almost all of the Kukilakila lots have also been converted. As the owner of the lake the ELRA and its board of directors take a very pro-active role in the management of the pond, with the ultimate goal to restore Kaelepulu to support diverse fisheries resources and recreational activities in clean water. In order to accomplish this goal, the ELRA requires payment of assessments from its members. These assessments are the result of lot ownership and are set as directed in the ELRA By-laws. The DPP of September 1987 expired in 2016. A new DPP was drafted and approved in December 2016 which extends the ownership and management of the lake by another 50 years. Read more about it here: Lake DPP. 1950 Aerial Survey shows the lake before dredging and filling. 1976 Aerial survey photo shows the current lake configuration. 1993 Aerial survey photo showing connection to the ocean at Kailua Beach Park.